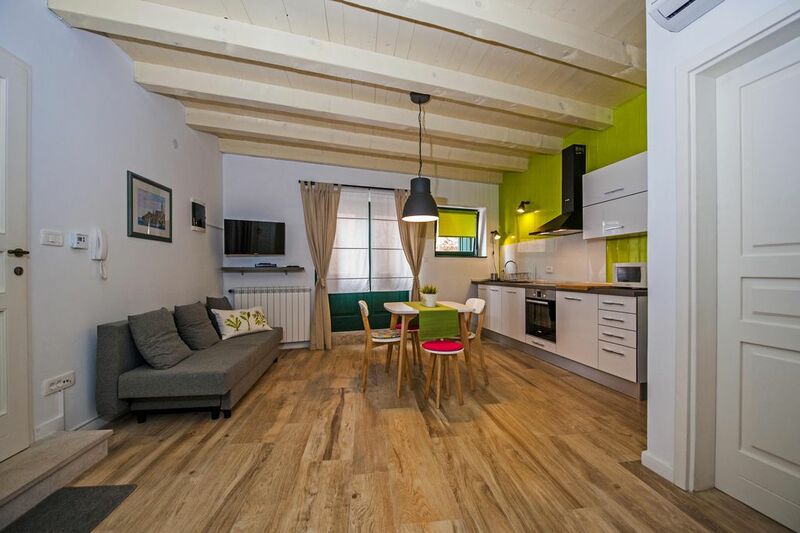 Luxury Apartments Rovinj are located in the centre of the town of Rovinj. The studio has wireless internet, satellite tv, air condition. Studio featuring a fully equipped kitchen with a dining area, a bathroom with shower, a bedroom, living room with tv, sofa bed (it can be used as sleeping facility for 1 person). Private parking close to unit. The sea can be reached in just 50 metres. A grocery shop can be found just 50 metres from the apartments, as well as restaurants, bars and cafes. The studio is a 5-minute walk from the Baroque Saint Euphemia Basilica Bus Station is 100 metres away, while nearest airport in Pula is 35 km away. Welcome to the beautiful Rovinj! Was für eine entzückende Stadt und was für ein tolles, gemütliches Studio. Wir wurden kurz vor Mitternacht sehr herzlich empfangen, fürs Auto gibt es einen Parkplatz ganz in der Nähe. Die Wohnung liegt optimal, nur ein paar Schritte vom Wasser/Hafen entfernt und 5 min. von der Altstadt. Das Studio ist sehr schön eingerichtet und sehr sauber. Wir haben uns unglaublich wohlgefühlt. Kleiner Tipp: Für das Finden der Wohnung empfehlen wir auf jeden Fall ein Navi, da es in Rovinj viele Einbahnstraßen/-Gassen gibt. On the magnificent coast of Istria (Croatia), right below the Lim Fjord, is the most romantic place in the Mediterranean! The town of Rovinj is the right destination for all of you seeking a sentimental atmosphere of the times that have forever gone by. In the Mediterranean, you can find it here, in the town that has begun its romantic life on an island, its restricted area resulting in crowded houses, narrow streets and small squares, still untouched by modern urbanism. On the seaside, the town is protected by a high rocky shore and house walls built on cliffs, while the mainland side is protected by solid walls. The town is dominated by the baroque St. Euphemia’s Church, its 60-meter tower providing a view of grey and red rooftops and chimneys, streets and squares, the port and pier with ships and boats, and the marina harboring yachts. This unique old town core, the 67-kilometer shoreline, 2,289 ha of protected green surfaces and improved park forests, 16 islands, islets and reefs, make this town unique. Built upon a rich fishermen’s tradition, it has become distinctive for its unique boat called batana and its songs bitinada. Its beauty was particularly appreciated by artists who have painted the most beautiful motifs here and exhibited them on Grisia, the street of artists.